Another small update to our Miner Control tool package for Nvidia GeForce GTX 750 Ti GPUs to reflect some of the recent changes in the pools that the tool uses. This version does include Quark support for NiceHash/WestHash as it seems to be the very profitable algorithm to mine at the moment at the two services according to their statistics. The Qubit and Quark algorithms often seem to be the most profitable ones to be mined on Nvidia GPUs, though there are temporary surges in other algorithms such as X11 or X13 from time to time that make them more profitable for a while with the launches of new altcoins. We have also included the latest version of ccMiner 1.5.47-git Fork by SP for Nvidia Maxwell GPUs such as the GTX 750 Ti, so that you can get optimum performance especially since there were quite a lot of Qubit and Quark optimizations lately. To be ready to use the GeForce GTX 750 Ti package you just need to update the account settings for each pool to reflect your BTC payment address. Do note that the default configuration that we have set is mining from time to time for the author of the software (Miner Control) as a donation alternative, but you can change that setting should you wish to. 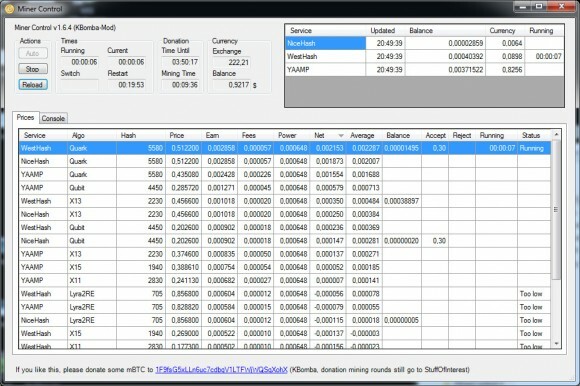 The package is ready to be used with GTX 750 Ti card, but you can also us it for other Nvidia GPUs or more cards (the ccMiner fork included is for Computer 5.0 and 5.2 cards only) – what you may need to reflect however in the config file is the total hashrate and power usage.